Eight thirty in the morning is the earliest I've visited a distillery so far, and I hope it stays that way. 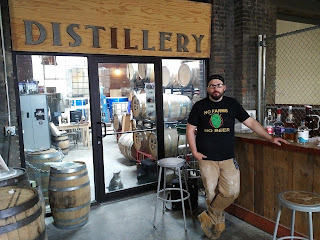 Despite the early hour, Luke, one of the distillers at The Albany Distilling Company, is very cheerful and helpful. It also looks like he may be their morning shift guy, since he is the only one here, aside from Cooper the cat. Luke is most excited about Albany Distilling's latest product: coffee flavored vodka. It comes from a partnership with Death Wish Coffee, a roaster in nearby Round Lake, NY. 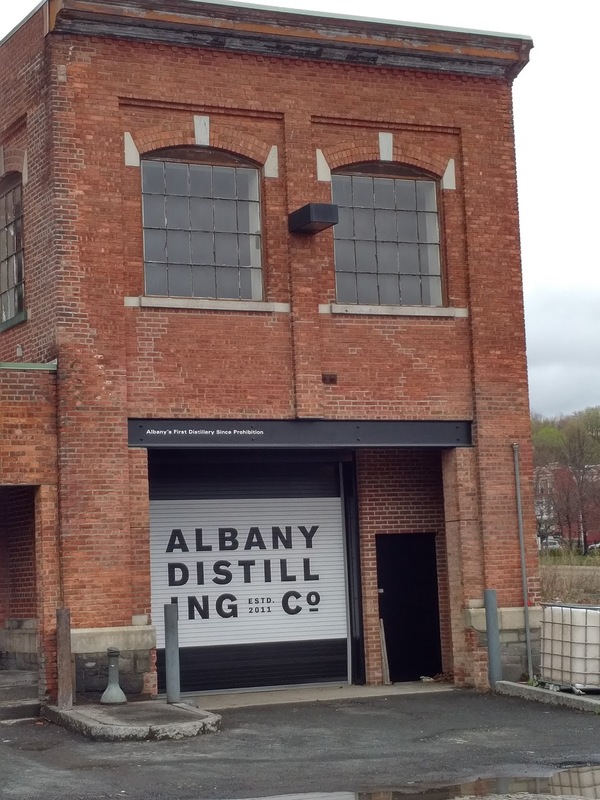 Albany Distilling starts with its flagship vodka, ALB, which is decidedly unexciting. They make that spirit by running corn neutral grain spirit through a column still, then charcoal filtering the resulting distillate. I try the plain vodka first. It smells faintly of alcohol and has a slight sweetness on the palate. In other words, it's indistinguishable from other quality craft vodkas - not such a horrible fate. Mixed with a cold-brew made out of Death Wish coffee, however, and I'm blown away. The nose is unmistakably coffee. There's enough sweetness in it -and remember, the ALB vodka's scent was very minimal- to make me think that some amount of sugar must be added. Tasting the vodka supports my suspicion. It has a great balance: the signature bitterness of a dark roast, cut with that toffee sweetness in a dulce de leche. It finishes on a hint of spice. I could easily drink a full mug of this - on the rocks, of course. It must have been fate, after all, that made me show up so early. Unlike most craft distilleries, Albany Distilling started making whiskeys first, before wading into clear spirits. Usually it's the other way around, since clear spirits, by definition, are unaged and can therefore be sold as quickly as produced (hopefully). Since Albany Distilling has been around for about six years, their whiskeys all have a nice age to them (except the white whiskey, of course). Technically, all three of their whiskeys -single malt, rye and bourbon- can be considered "straight," or aged at least two years in new oak barrels. Only the single malt has the designation of "straight" actually on the label, since the bourbon and rye might each be blended with younger barrels. The bourbon is from a 68% corn, 25% rye and 7% barley mash, so would be considered "high rye." The nose is not so distinctive of that style, however, in that I get mostly apple and dried fruit. The palate is forward with grain and oak, mellowing out to apple and bitter melon. There is a distinctive burn throughout, though the proof is not super high, at 86. The rye is made from 75% rye, 25% malted wheat mash, and is 86 proof. The nose is a deep mix of dried fruit and wood. The palate takes me through wet soil, chocolate, fruit, and plum on the finish. The single malt, at 86 proof, strangely does not have those sweet and chocolatey baking notes typical of malted grain. Instead, there is a musty fruit on the nose, like clove and apples. The palate is yeasty and sour, like a fresh sourdough. I would think two years in a barrel would have oaked some of the fresh-mash flavor out of the whiskey, but it looks like it needs longer still. Albany Distilling makes two rums, both from a Caribbean molasses mash. Both are 80 proof. The only difference is one is bottled unaged and the other is bottled after several months in used bourbon barrels. The nose on the unaged rum is slightly sweet, while the palate is smooth, with a hint of pear, grape or other light fruit. The aged rum smells of sweet earth, and has the wood and char, with just a hint of sweetness, typical of aged rums. You only need to walk around Albany a little bit to gather that they are really into their history (does every building need a plaque?) There's no reason the distilling company that takes the city's name should be any different. Before I leave to start my day, Luke tells me that Albany's first ever distillery, Quackenbush, dating back to the mid 1700s, stood on a site next door. (There's a modern-looking brewpub there now). During the excavation for the parking garage, crews found a handwritten recipe for rum. Albany Distilling got their hands on it, and that is how they make their rum currently, with a few tweaks in how they source the molasses, water and yeast (the recipe says the molasses should be fermented with wild yeast from the air). I'm all for situating yourself in a tradition, whether a person or a business. Sometimes, all it takes is a restoring a historical name, or you can nail a sign to a wall. For Albany Distilling, it's a little bit of both.